When do you think this photo was taken? Last summer? Wrong. Today. Yes, mid-April and we are having Summer weather. Those of us who have been around for a while know what that means – rain in July. Every year that we’ve had fabulous and strangely warm weather in April, it rains like hell in July/August. We’ll have to see what happens this year. But you read it here first! 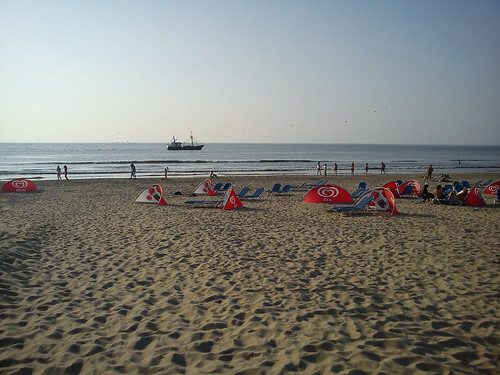 Today after work we headed to the beach at Zandvoort. I came home on the train from Amsterdam as usual, but instead of biking home, DB met me on the train and we continued the 10 minutes more to Zandvoort. 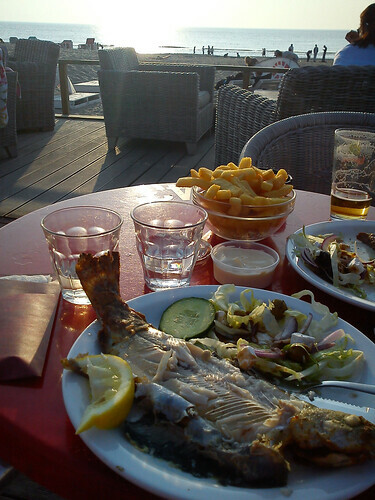 We walked along the beach for a little while, then headed up to Bruxelles aan Zee for dinner. I had a trout. DB, lamb. We finished while the sun was still on the horizon and it was still warm. This heat wave is supposed to continue for another week. Let’s make hay while the sun shines!